Carol J. 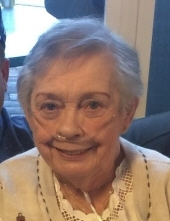 (Hurst) Bernard, 81, of Harrisville, passed away Thursday, August 30, 2018 at home surrounded by her family. She was the wife of the late Robert E. Bernard Sr. Born in Woonsocket, she was the daughter of the late Francis and Eleanor (Lyons) Hurst Sr.
Carol worked at Zambarano Hospital for many years. She enjoyed sports and was a die-hard Patriots, Red Sox and Notre Dame fan. She is survived by a son Timothy Bernard and his wife Jessica of Chepachet; two daughters: Susan Webb and Patricia Gonyea, both of Burrillville; a brother Francis Hurst Jr. of Woonsocket; two sisters: Eleanor Wright and Patricia Bourque, both of Colorado; nine grandchildren and ten great grandchildren. She was the mother of the late Robert E. Bernard Jr.
A Mass of Christian Burial will be held for Carol on Tuesday, Sept. 4, 2018 at 11 AM in St. Joseph's Church, 183 Sayles Ave. Pascoag. Burial will follow in St. Patrick's Cemetery, Burrillville. Arrangements are under the direction of the Boucher Funeral Home, 272 Sayles Ave. Pascoag. In lieu of flowers, donations in her memory may be made to the American Lung Association of RI, 260 West Exchange St, Suite 102 B, Providence, RI 02903. To send flowers or a remembrance gift to the family of Carol J. Bernard, please visit our Tribute Store. "Email Address" would like to share the life celebration of Carol J. Bernard. Click on the "link" to go to share a favorite memory or leave a condolence message for the family.